How does a state like New Hampshire with no commercial casinos or legal real money poker gambling venues and a population of only 1.3 million ever expect to legalize state regulated online poker and real cash Internet poker websites? The answer: Not easily. Such is the dilemma facing lawful online poker advocates in New Hampshire. To date, there is no clear path towards online poker and legit Internet poker legislation, and unfortunately, the prospect of a real money poker websites bill being passed within the next few years in the Granite State is rather dim. The good news is that there is no existing Internet poker law that clearly prohibits playing real money poker games like Texas Hold’em at online poker websites in the Granite State. In fact, dozens of US-facing online poker websites remain accessible to NH inhabitants looking for real cash poker gambling on the Internet. In addition, there have been preliminary talks about bringing online poker and regulated lawful real money poker betting websites to New Hampshire; talks that will likely gain steam if a neighboring state like Massachusetts decides to enter the fray and comes out with its own legit real money Internet poker website. Better to Live Free or Die. We think so, especially when gamblers in New Hampshire can easily enjoy our real money US poker sites. 3 Can Players from New Hampshire Play Online Poker? 4 Is Online Poker Legal in New Hampshire? In mid 2013, a bill that would have allowed 5,000 slot machines and 150 table games like Texas Hold’em poker to be installed in an already existing real money gambling facility in NH, died in the State House. Officials voted 199-164 against the lawful poker gambling bill SB 152 being brought up for a full-vote . Opponents of the poker betting bill feared that opening a commercial casino and live real cash poker room in New Hampshire would encourage bad gambling habits among its residents. Others reasoned that opening one casino or lawful poker room would set off a domino effect, eventually leading to multiple brick and mortar casinos and real money poker gambling rooms being built throughout the state of NH. In August 2013, several months after the real money gambling bill SB 152 was rejected, a special commission was brought together to piece together a new real cash betting bill . The revised bill was set to be drafted by December, one month before the New Hampshire state legislature returns. NH Governor Maggie Hassan has exhibited her support for such a lawful poker gambling bill, believing that such a bill would increase tax revenue in several critical areas by earning the state money on all the real money poker betting and gambling played out in New Hampshire. Her hope is that New Hampshire will follow in Massachusetts footsteps by opening at least one Vegas-style casino and live poker venue offering games like real cash Texas Hold’em to gambling fans in NH for the first time ever. The opening of a casino and legit real money poker room would also bode well for online poker and legal Internet poker websites in New Hampshire, as it could potentially provide online poker companies and Internet poker operators with a physical poker gambling location to set up operations and link in with legal poker websites. Can Players from New Hampshire Play Online Poker? Yes. Despite the lack of a commercial casino or real cash poker room and state gambling and betting regulation, it’s perfectly possible for players to deposit real money at one of many online poker websites that currently accept players from New Hampshire. 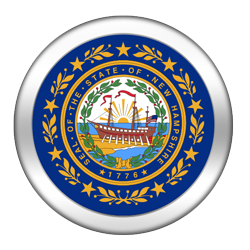 Online poker legislation has not been addressed in any shape or form in the state of New Hampshire. Former NH Governor Lynch briefly alluded to the merits of regulated online poker and legal websites in 2010, but since then, very little has been verbalized on the subject. The New Hampshire state Lottery attempted to bring its real money gambling services online, but the Internet betting proposal was promptly voted down. Even the presence of Internet cafes, where NH gambling fans could potentially play real money poker on Internet poker websites, does not sit particularly well with New Hampshire government officials, leading one to believe that New Hampshire is in no position to legalize state regulated online poker and create legit websites. But for all of its grievances against Internet gambling and poker websites, New Hampshire does not have a law that specifically targets online poker or bans gambling enthusiasts in NH from playing games like Texas Hold’em poker for real cash at Internet poker websites. Although it is always best to first consult with a legal professional who knows the ins and outs of Internet poker gambling, we have put together a few interesting tidbits regarding New Hampshire’s gambling and poker betting laws  that should help you make a more informed decision regarding the legality of online poker. Gambling is defined as risk[ing] something of value, including real money, upon a future contingent event not under one’s control or influence, upon an agreement or understanding that something of value will be received in the event of a certain outcome. Gambling in New Hampshire is considered a misdemeanor if the person knowingly and unlawfully owns a business that permits gambling or betting on the premises of the business. New Hampshire, unlike some other states, imposes harsher penalties on those who run bigger poker gambling or casino betting underground operations. It states that a person is guilty of a class B felony if his gambling business generates gross revenue of $2,000 in a single day, or is in operation for at least 10 consecutive days or accepts wagers exceeding $5,000 during any 30 day period on future contingent events. Players who merely participate in gambling activities like real money poker betting are not mentioned. Poker, and more specifically online poker at real cash Internet poker websites, is not referred to in the New Hampshire State’s statutes. New Hampshire’s gambling and betting history is relatively quiet compared to other east coast states. Like in most of the original 13 colonies, illegal gambling activity and real money poker betting was prevalent throughout New Hampshire dating back to the 1700s. In 1906, the famous real cash gambling and poker betting venue Rockingham Park  was opened in NH, and subsequently shut down three days later. It would reopen its doors in 1933, when the state legalized pari-mutuel betting. Around the same time, many neighboring states also began legalizing gambling real money on horseracing, largely to counteract the crippling effects of the Great Depression. Unfortunately, live racing is no longer permitted under New Hampshire gambling and betting law, but Rockingham Park still acts as a full-card simulcasting provider for NH real cash gambling fans. Many years later, in 1964, New Hampshire was the first state to launch a statewide real money lottery. At the time New Hampshire was desperately in need of revenue, and saw the lottery as one of the most reliable and fastest ways to generate tax income by collecting profits from all the real cash betting NH residents who were playing the lottery. Unfortunately, there are very few regulated gambling or lawful real money poker options in the Granite State. The state of NH hosts no commercial casinos offering live real cash poker gambling, no tribal casinos and no horseracing. What it does allow is pari-mutuel simulcasts from its racetracks. New Hampshire also boasts two dog track racinos: Lakes Region Casino in Belmont and Seabrook Greyhound Park . There are several facilities that offer a limited array of table games and poker variants like real money Texas Hold’em betting. However, they do not act as full-scale real cash poker providers, offering only Sit & Gos and multi-table real money poker gambling tournaments – no real cash poker games. A portion of the proceeds from each legit real money poker event is donated to charity. In New Hampshire, you can play poker at land-based, licensed rooms, but don’t look for the Granite State to legalize online poker in the near future. At the time of this writing, there are no state regulated online gambling and full on real money poker cardrooms options in New Hampshire. Whether that changes or not in the upcoming years is largely at the discretion of new NH government officials, and likely dependent upon a brick and mortar commercial casinos and real cash poker gambling venue opening within the Granite State’s borders. But given the New Hampshire lottery’s failed attempt to establish an online presence, the prospects of a lawful poker sites like PokerStars ever coming to New Hampshire sans federal level Internet poker legislation seem pretty grim. Despite New Hampshire’s almost complete absence of regulated gambling options and real money poker betting rooms, it had the single highest online real cash poker participation rate (pre-Black Friday) of any state in the nation, beating out the likes of known gambling and poker betting states like Nevada, and neighboring states Massachusetts, Vermont and Maine . During a six-month period spanning over 2009-2010 it was revealed that 0.97% of the state’s population engaged in online poker at real money Internet poker websites – almost double the U.S average for real cash Internet poker gambling. Clearly, players in New Hampshire enjoy firing up their computers and playing online poker at real money Internet poker gambling websites. But just because games like Texas Hold’em poker are favorite pastimes of NH residents, this does not mean legit Internet poker playing for real cash will be regulated by the state of New Hampshire anytime soon. In fact, it’s extremely likely that online poker and Internet poker gambling will never be regulated by New Hampshire’s government. Instead, it’s more plausible that the federal government will step in and regulate online poker by allowing legal real cash Internet poker betting throughout the United States before New Hampshire even addresses the issue of lawful poker websites. We could be wrong, but even in a best case scenario, expect to wait until at least 2015 before New Hampshire enacts a real money gambling and Internet poker bill into law. The good news is that Maine and Massachusetts have changed their minds about commercial casinos and live real money poker gambling venues, and are well on their way to establishing a more pronounced gambling and real cash betting poker and casino presence within their respective territories. New Hampshire will likely follow suit into the lawful real money poker betting industry, and if not, at least NH residents can drive to a neighboring state for a casino getaway and enjoy legal real money poker gambling there! ↑ The Highest Online Poker Participation Rate in the U.S Goes To?